Everyone expected an exciting fight from Chang Sung Jung (aka the Korean Zombie) and Dustin Poirier at UFC on Fuel TV 3 on Tuesday night in Fairfax, Va., but few could have imagined how impressive the Korean Zombie was in victory. He and Poirier threw everything that had at each other for the better part of three rounds, but it would be Jung that proved to be the man of the hour. Jung and Poirier unloaded on each other in rounds one and two, Jung edging ahead at times, being the more active striker, and landing more power shots, and opening a cut on Poirier’s head. And just when Poirier started to find a groove for his own striking attack, Jung shifted gears, rolling with a Poirier takedown attempt, turning it into a full mount. Following a brief stint of ground and pound, Jung dropped off into a stunning array of submission attempts, transitioning to armbar then to a triangle choke, back to an armbar, and then finishing the round with another triangle choke as time an out. The two traded shot for shot during round three, Jung ruling the early and late portions of the round, Poirier taking control in the middle. Jung, however, took the fight home in round four. He landed a right uppercut followed by a left hook that staggered Poirier into the fence. Poirier bounced off the fence into a takedown attempt, but Jung locked on a D’Arce choke as he did, cinching it down as they hit the mat. A moment later and the Poirier’s lights went out; fight over. 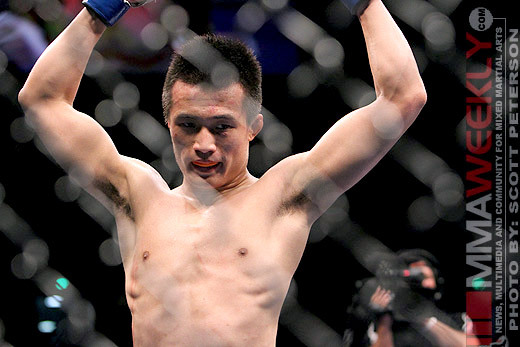 After two exciting, but losing efforts in the WEC, Jung has now won three consecutive fights in the UFC, putting him on the fast track towards a title shot. Aldo has a fight with Erik Koch at UFC 149 on July 21, but should he win that, it wouldn’t be surprising that Chan Sung Jung just earned the next shot at the UFC featherweight champion.